We’re live at the “Using Tumblr to Sell Your Ideas” panel. Our panelists include Ghost Rider writer Felipe Smith, My Little Pony artist Katie Cook, and The Wicked + the Divine writer Kieron Gillen. You can even submit questions to their blog [but not anymore…the past has passed…-ed.]. If someone steals content you originally posted on Tumblr, that’s misatributation and you should go to Tumblr.com/abuse and file a complaint. If someone posts content on their Tumblr that you originally posted somewhere else such as DeviantArt, that’s copyright infringement, and you should file a DMCA complaint. How do you use Tumblr on the day to day? Katie uses Tumblr to favorite content she likes; she does 30 day drawing challenges that allows her to draw content from fandoms she doesn’t work in such as Harry Potter. This draws content to her webstore. Felipe says “I kinda look at it, try to assess what I’m doing,” how the fans respond to the content he creates. 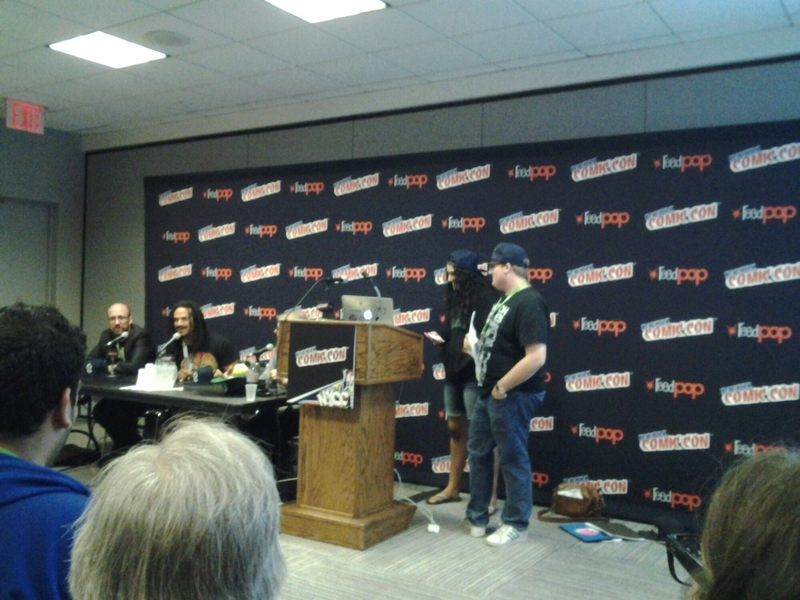 Kieron says he has always had a “fascination with fandom and how fandom operates.” He started using it after Journey Into Mystery, when he discovered a fandom for Kid Loki. His biggest thing is directors notes for the books he writes. He likes Tumblr because it creates “a low stage,” bringing creators closer to fans. Katie likes using Tumblr because, in her words “she is old…it’s a good platform for starting out.” There are a huge number of people on the site and new content from you will just appear on your dashboard, as opposed to screaming out into the abyss of Twitter, trying to convince people to click through to your comicspress plugged-in wordpress site. Kieron says that Tumblr is not the ideal form for writers, as it’s a very visual medium. Twitter is a bigger playground for quippy one line jokes, and visual humor thrives on Tumblr. For writers, Kieron likes looking at and reblogging fanart, as it plays to the strengths of the medium. Plus, writers aren’t allowed to look at fanfiction, but they are allowed to look at fan art. Katie adds that “the second you go past five lines on Tumblr, it’s ‘too long; didn’t read. '” Each medium should be approached differently; instagram is great for WIP, Instagram/Tumblr is ideal for final images, twitter is for one-liners, and Facebook is for longer life anecdotes. Panel moderator and Tumblr rep Marlene says that she likes to “tag the top five fandoms my post relates to, followed by my personal tags.” Even if something doesn’t go viral immediately and you’ve tagged correctly, don’t despair! Data shows that tagged posts get more views over time. Kieron responds by stating that he was always a bit too personal, and since he’s gotten popular he can’t post anything TOO egregious, because someone WILL take it out of context and “use it to destroy you.” He apparently keeps a fitness blog (about his failure to keep fit). Katie cautions that you shouldn’t put up every single thought you have. “Oh I forgot my deoderant.” Don’t post just that one line unless you can turn it into a story about how you met the “SNL celebrity” after “dashing to Duane Reade.” Try not to be mopey about things; have fun and put your best foot forward. Felipe says that it’s tempting to post random stuff on the internet because we, as a species, “crave instant graitification.” The more Felipe knows about a creator, the more it colors the way he sees their art. He tries to keep it more “pitch”-like rather than personal so that gap isn’t bridged and fans don’t end up hating his work because of him. In response, Kieron suggests a middle ground where he talks about what he’s reading and what he likes. It’s not too polarizing, but it does help fans feel a little closer to him. Another Tumblr rep suggests that you should stay positive because no one wants to know overly negative people and if nothing else, agents and other creators are looking at your social media. Katie says she follows anyone who draws better than her. Felipe states that he follows people that make him happy and don’t blow up his feed too much. Kieron says he doesn’t follow many other creators unless he’s friends with them, but he does follow a number of fashion blogs because of how it influences his and the rest of the creative team’s work on The Wicked + The Divine. He then returns to tags, expressing that he does not use the #comics tag because it’s way too broad, and is worried about tagging #darthvader in a multi-subject post. Felipe says that if you comment on comments, especially those that are passive aggressive towards you (keeping your response positive of course), others will jump in on the conversation. Kieron expresses that that “jumping in” is the reason why he doesn’t respond to aggressive statements unless they’re factually incorrect, in which case he just states the facts without editorializing. Felipe started out by only posting original art on his tumblr, but you can tag your art with related fandoms, the medium(s) you worked in, etc. If you have specialized tumblrs, tag your posts with your name and reblog those posts to your personal tumblr. Any more about this topic? Hey stranghero, it was the tail end of the panel so they didn’t get to dwell for too long on the topic. Perhaps a follow up is in order!